Even with wine, the old must give way to the new. Presenting the next generation in the wine industry. With a large number of international guests, expats and well-travelled South Mumbaikars calling it their second home, you'd expect The Table, a fine dining restaurant in south Mumbai, to have the best selection from wine cellars across the world. So, when the wine menu has a quarter of its collection dedicated to Indian labels, it's an affirmation that home grown wines are catching up in quality and popularity with imported labels. "Indian wines are growing in their quality, are very drinkable, good value for money and rank with the new world wines. Even international tourists prefer to try Indian wines," says Gauri Devidayal, founder, The Table. The consumption of wines has registered a steady growth over the last few years. The Indian wine industry, still considered a sunrise business, is experimenting with new grape varietals, wine-making styles and offbeat offerings to the consumer. The trend is fuelling a demand for wines in urban India. A 2014 Vinexpo survey predicted that wine consumption in India will rise to 2.1 million cases by 2017, an increase of 73 per cent from the 1.21 million cases in 2013. Interestingly, red wines constitute 61 per cent of the total demand for wines. "Consequently, a new set of winemakers, who have been successful in other ventures, are getting into the 'boutique wine' business with sheer passion and commitment," says Abhay Kewadkar, Director, Four Seasons wines. 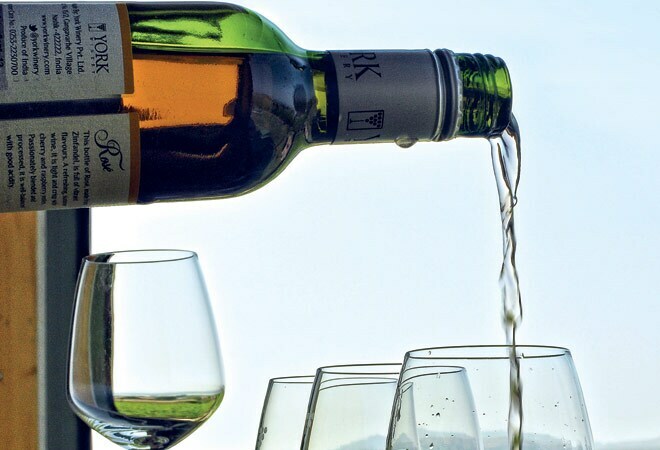 From introducing Sicilian grape varieties like the Nero D'Avola to bringing in the French Malbec, there is a lot that the India-produced wine menu has on offer for connoisseurs of spirits. A look at the newest faces to grace the Indian wine industry. When Ravi Gurnani launches his new Reserve Blend of Shiraz and Cabernet Sauvignon later this year, each bottle will be numbered to convey that it's one among the 4,700 bottles of the blend to hit the market. "The wine biz is all about selling experiences. In a market where people have a lot of options, you have to do something different to attract them," says the 30-year-old owner of York, who runs the family winery with his winemaker brother Kailash, 26. Since its launch in 2008, York has been coming up with something new each time to stand out in a crowd. The grapes for their Shiraz come from the family's sixacre vineyards in Nashik, which Gurnani says "serve as model vineyards" for the farmers from whom they source other grape varieties. When Kailash returned from Australia in 2012 with a degree in oenology, his first harvest produced a Cabernet Merlot blend. Despite the number of wineries and varieties available, wine consumption and awareness in India is still in a nascent stage. Therefore, marketing becomes important. Through the York Live Festivals in 2011 and 2012 and the tasting room at its winery, the Gurnanis intend to create experiences that people can connect to. "In India, there is no context for wine; it's yet to become a subject of conversation. So, when people take a tour of the winery, it creates an experience for them," says Gurnani. Such memories, he hopes, will prompt people to pick York the next time they go wineshopping. Chenin Blanc, is to look out for. 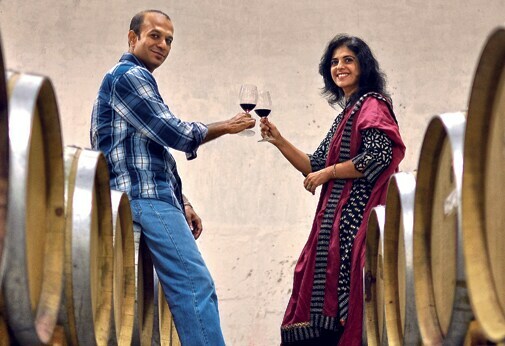 Yatin and Kiran Patil raise a toast at the Reveilo winery in Nashik. 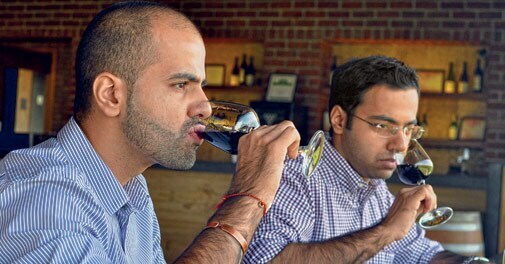 A decade ago, when Kiran and Yatin Patil decided to quit their well-paying "9 to 5" corporate jobs to set up a winery, they didn't know that they "were jumping into an ocean". Spurred on by large ancestral vineyards that came down their way, they set up Reveilo in 2006. Today, the family run brand is credited with introducing the Chenin-Cabernet audience to Italian grape varieties such as Sangiovese, Nero D'Avola and Grillo. "It was an attempt to offer the consumer something different," says Kiran, 40. It helped that the grape varieties adapted to the Nashik terroir with ease, and the wines were found to pair well with spicy Indian food. With the more popular Chenin Blanc, Merlot and Syrah also in their portfolio, Reveilo classifies its wines into four categories - the regular range, Italian varieties, the Premium (Chardonnay and Cabernet Sauvignon) and the Reserve range, which also includes a late harvest Chenin Blanc. "There's a wine for everyone, from the easy-to-drink light Grillo to the barrel aged Cabernet Sauvignon," says Kiran. Their sales data shows that most people in India still prefer lighter and less complex wines. The Syrah and Chardonnay are among the Reveilo bestsellers, and of the 8,000 cases they sell every year, the premium range accounts for only a quarter. After spreading themselves "too thin" as Kiran terms it, the couple now prefers to focus on smaller markets such as Mumbai, Pune and Bangalore. - A SLICE OF SICILY The Nero D'Avola and Grillo are native to the Italian countryside. Reveilo was the first winery to bring Italian grape varieties to India. - WINE AND DINE Pair the Nero D'Avola with paneer tikka masala; the Chardonnay complements a chicken kebab well. 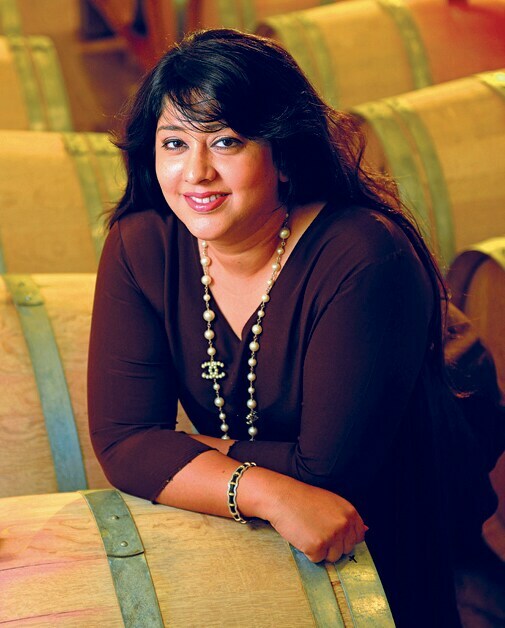 With varied businesses in event management and real estate on track, Shaambhavi Hingorani, 40, ventured into the wine business, first as an agriculturist with vineyards, and then as a wine producer with the SDU Winery which was launched in 2011. With an initial capital investment of `5 crore to source equipment from Italy, she roped in Italian winemaker Andrea Valentinuzzi and reaped the first harvest in 2013. At its 50 acre vineyards, SDU grows three French grape varieties-the Syrah, Cabernet Sauvignon and Chardonnay. SDU's offerings can be classified into two categories-the Deva brand and the Reserve range. The Deva Syrah, Deva Cabernet Sauvignon and Deva Chardonnay are easy drinking wines, aimed at beginners. The Reserve range with the Reserva Syrah, Reserva Cabernet Sauvignon and Reserva Chardonnay is a premium offering that's been aged in French oak for 12 months. "The Deva range is perfect for anyone who wants to enjoy a glass of wine at a social gathering, whereas our Reserve range of wines target more serious wine drinkers," says Hingorani. For now, SDU's wines are south-bound with a presence in Karnataka, Goa and Pondicherry. The SDU Reserva Chardonnay contains hints of citrus and tropical fruit. The Deva Syrah pairs well with white meats and Indian cuisine. 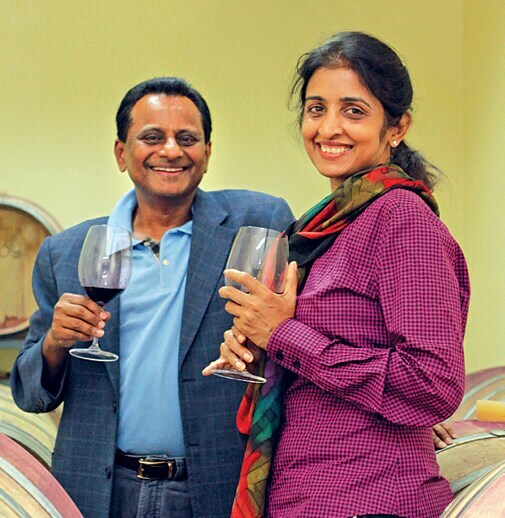 It was a teenage passion that prompted Krishna Prasad Chigurupati, 59, to turn vintner in 2010. The owner of pharmaceuticals company Granules India took up a vineyard in picturesque Hampi, brought in experts from the world over and set up a 100 per cent estate-bottled facility. "He brewed home wines and collected wines. We've visited every major wine-producing region in the world", says Uma Chigurupati, 52, who along with her husband, is the force behind KRSMA. At their 180-acre estate in Hampi, the couple cultivates Sangiovese, Chardonnay and Cabernet Sauvignon. Business head Sneha Rao, 29, says that KRSMA is a single varietal brand that doesn't make blends. For now, KRSMA is making its produce available only in restaurants and retail stores across Bangalore. With their first batch ready for export to New York, KRSMA plans to gradually increase the numbers. Until then, they are happy to pick up the occasional award at international platforms such as the Decanter Asia Wine Awards. -FLAGSHIP BRANDS The Cabernet Sauvignon accounts for 60 per cent of KRSMA sales. The Sauvignon Blanc won a gold medal at the Decanter Asia Wine Awards. Shailendra Pai with Advait Pai (extreme right) and winemaker Sanket Gawand (centre) at VallonnÃ© Vineyards, Nashik. It was during his travels across the world that 60-year-old Shailendra Pai developed a passion for wine, giving rise to a dream that eventually blossomed into a respectable business establishment. Today, VallonnÃ© Vineyards seems like a patch of France on the southern slopes of Kavnai village in Nashik district, complete with equipment from Bucher Vaslin and Gai, a winemaker from Bordeaux, and grape varietals a la Francaise. According to Pai, a lot of time and expertise goes into each bottle of wine that makes it out of his stable. "We have viticulturists who tend to the vineyards through the year. The vines are planted on south-facing slopes to ensure just the right amount of sunlight exposure, and the soil is perfectly gravelly. While the wine is processed under the watchful eyes of experts, the cellars are tucked away 20 feet underground for complete protection from heat and light. Also, instead of focussing on extracting the maximum juice, we crush the fruit only up to a desired level to ensure the highest aroma and flavour." VallonnÃ© offers a bouquet of wines ranging from the premium to super-premium. Whether it's the Merlot, barrel-aged for 12 months, or the Anokhee, barrel-aged for 15 months and then bottle-aged for another 42, each product to emerge from the VallonnÃ© stable conveys the exoticism of India while retaining the Frenchness that's inherent to wine. As far as the "snob value" attached to imported wines is concerned, Pai says that the winds of change are blowing. "Expats form a large part of our customer base in India. In fact, some of the imported wines sold here do not match up to good Indian wines in terms of quality," he says. - MILESTONES GALORE Vallonne has already gathered many a laurel, including the country's first reserve Malbec, aged 15 months in the barrel and eight months in the bottle, and a Rose, made from Cabernet Sauvignon. - WHAT'S NEXT A Shiraz Merlot blend that's coming out soon.